The world could easily have been a very different place. Instead of playing an immigrant mechanic on Taxi, comedian Andy Kaufman could have been a mischievous robot manservant on Stick Around. David Letterman might never have conquered late night had he clicked as a game show host on The Riddlers. Elvira, Mistress Of The Dark, could have been a sitcom star, playing a fraudulent psychic. And weekly shows based on Turner & Hooch, Revenge Of The Nerds, Legally Blonde, Coming To America, and Coneheads were all once in the planning stage. 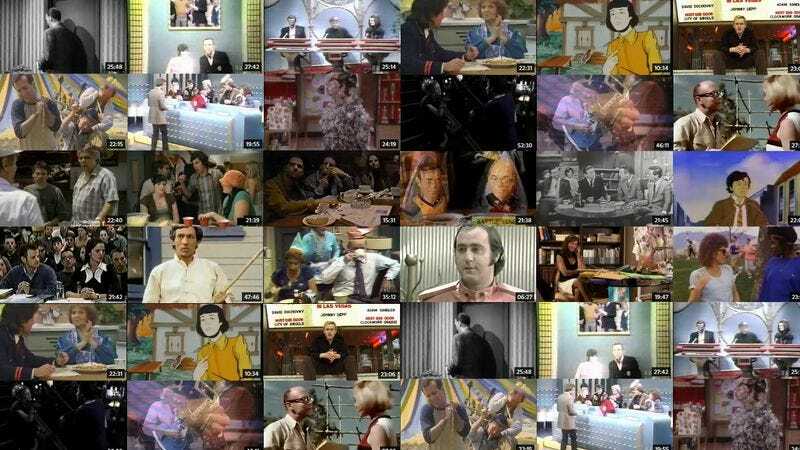 These are just a small sampling of the revelations found on a DailyMotion channel called UnknownArchiveTV, which collects dozens of unaired, unsold, and largely forgotten pilots for network television series. It’s a goldmine of dashed dreams, failed schemes, and roads not taken. Observant viewers will note that many of these orphaned pilots are attempts to exploit existing properties, such as small-screen versions of hit movies here, or strange spin-offs of existing shows. In 2003, the world was cruelly denied the adventures of Young MacGyver, the equally resourceful nephew of the famous adventurer and operative. And would Buffy The Vampire Slayer have worked as an animated series? Fans can only watch the unsold pilot and dream of what might have been. Viewers who choose to plumb the depths of UnknownArchiveTV will find hours upon hours of choices, with shows spanning at least six decades. Along with a great many series that never made it to air, there are alternate versions of shows that did find a place on the schedule, like this full-color pilot for The Munsters. And then there are the shows featuring actors and actresses who would eventually find success on television, just as part of different projects. A perfect example of this is the aptly named Nobody’s Watching, featuring future Saturday Night Live star Taran Killam as a couch potato who’s convinced that he and his dimwitted pal can make a better sitcom than what the networks were offering at the time. The rest of the pilot disproves that theory.